Big Interview is used by millions of achievers in over 100 countries across the world. It’s also used by more than 200 universities to help prepare their students for job interviews (including NYU, Notre Dame, UC San Diego, and many others). FORBES named Big Interview one of their "Top Websites for Your Career"
Do you see yourself as a master of persuasion? Able to convince employers to hire you based on only on your confidence and communication skills? Or are you relying on a stroke of good luck to whisk you away to your dream position? Do you feel the like you’ve gotten a step-by-step system that will ensure your job interview success from the other advice you’ve read online (or in books)? Or have you just printed out 100 pages of random Google results, closed your eyes, and hoped for the best? When you hear yourself speak, do you think hiring managers will be dying to give you that dream job and salary? Or are they passing the time trying to guess what font you used on your resume? Our tested, step-by-step training platform to seize control and learn exactly what hiring managers are asking, sell yourself as a star candidate, make your nerves and anxiety disappear, and interview and negotiate so you’re paid what you’re worth. Who Am I Learning From? Why Should I Care? "A guru in the world of job interviews"
You’re learning directly from Pamela Skillings, the person considered to be the best interview coach in the U.S.
Pam was called “A Guru in the World of Job Interviews” by The Wall Street Journal. Think about your favorite athlete - every professional athlete has a professional coach… Every. Single. One. You can’t do it all alone, and real achievers know that. Hi, I’m Pamela Skillings. I’m an interview coach, career counselor, and bestselling author. A few years ago, I started Big Interview to bring the same training and tools that I give to my elite clients during one-on-one coaching to a larger group of achievers. Over years of coaching individual clients and teaching hiring managers how to screen candidates I’ve learned that there is a system for giving a winning interview. There’s a way to take away all the ambiguity, the well-intentioned but incorrect advice from family and friends, the nerves, and instead concisely present yourself in a way that “pushes all the right buttons” for a hiring manager. But try googling “job interview advice” and see if you find anything that matches up. You’d probably find anecdotes about humorous answers to “trick” questions (try at your own peril), reminders to bring a resume, and questions to ask on the day of your interview, or a list of common job interview questions. But you won’t find the hands-on practice tools we’ve developed and tested with hundreds of thousands of users to help them confidently win their job interviews. It’s true. Most people don’t like job interviews. When most people come to Pamela for coaching it's because they’ve usually made a big mistake. They mistake a job interview for a “normal” business conversation (when it’s way more complex than that). In fact, it’s a very weird and unusual human interaction. Think about it. In most interviews you’re not 100% sure what to say... and the interviewer is just sitting there, looking at you with a critical eye. It can be very unsettling. No wonder most people hate interviewing. Interviewing is a skill-set (like playing a piano, being good at a sport, or riding a bike) - but most people are under the illusion that just being able talk to managers or clients in a business setting will somehow translate into being good at interviews. It’s only after they’ve had the pain of 2 or 3 (or more) failed interviews that the reality sinks in. Don’t waste any more interviews. Each one is a precious opportunity to convey the best of who you are. Listen, you’re not going to get great at interviewing by waiting until the last minute. Make it easy for yourself and start today… just take a baby step. You can either prepare well for every interview - or risk missing out on a great career with a great company. Most people waste their 1st, 2nd, or 3rd interviews before learning the techniques we teach. Stop wasting golden opportunities. You don’t want your first real job interviews to be wasted “practice” runs. That’s what most people do. Don’t be like most people. Achievers don’t do that. They do the exact opposite. They know truly exciting job interviews are rare, so Achievers feel they owe it to themselves to be as prepared as possible for every interview. Some people are under-confident, but most people are actually overconfident. We give you the best advice money can buy. This is not a magic formula. There’s only one sure way to be your absolute best.... Practice. But you already know that! What we do is give you an easy WAY to practice. A Proven System for Better Interview Skills. Developed by top interview expert Pamela Skillings, Big Interview combines a full lesson curriculum with a powerful practice tool to give you everything you need to succeed. When preparing for a job interview, it's not enough to just read advice — you need to put that advice into practice! That's why Big Interview isn't just a training course. 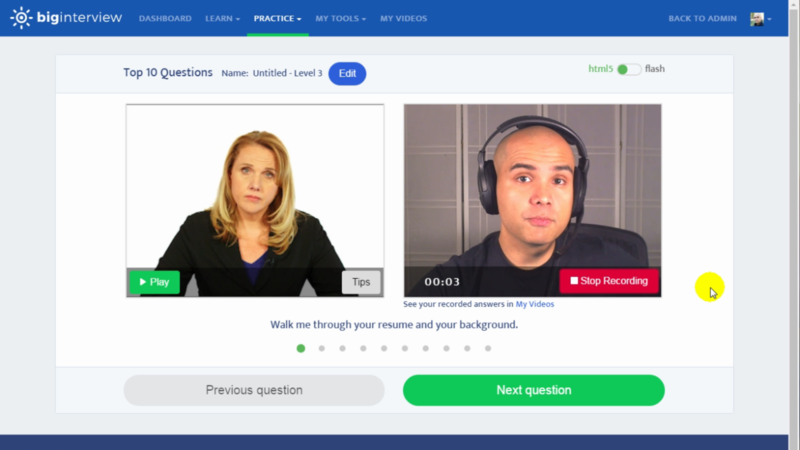 Our interview practice software connects with your webcam and lets you practice with our library of thousands of mock interviews tailored to your specific job, industry, and experience level.Never miss a question again! Just how good is Big Interview at training you to win? "I just wanted to let you know I got the job! Thank you so much for all the help you provided and how you helped me be confident in my interview. Once again, thank you for everything. You helped so much!" "I was interviewed by Amazon 3 times and I prepared for the interviews with Big Interview. I must say you have done a great job, you taught me a simple yet a solid framework! I NEVER email companies like this, but this time I forced myself to email you as I got the job at Amazon with an amazing offer." "I only had a couple of days to prepare but nailed the interview today. I know I have a few days left to cancel but feel free to charge my account for another month. It was totally worth it. Felt very prepared. Thanks, Pam." Ten modules full of video and written training from Pamela Skillings From learning Job Interview Fundamentals in Module 1, to learning how to close the interview and Ask Smart Questions in Module 10, our full video curriculum leads you through every step of the interviewing process. Here you'll learn how to confidently answer even the toughest questions and learn up-to-date strategies you won't find anywhere else. Industry-specific, difficulty adjusted, and always available. Get a well-rounded view of the type of questions to expect during your interview and practice answering them all. Whether they’re behavioral/competency-based questions or questions specific to your industry (100+ industries covered! ), we’ve got you covered. Practice makes perfect! Take your unique background and experience to craft interview answers that WOW with this proven 4-step framework. No more reciting stock answers from the internet or “stretching the truth” — use the answer builder to shine as a candidate and tell stories that clearly communicate key competencies to hiring managers. Instant access to the full 10+ Module Video Curriculum, powerful Interview Practice Tool and Question/Answer Library, the Answer Builder, and more - is just $79 for 30 days of access. Private coaching clients pay Pamela Skillings thousands of dollars for her interview training. With Big Interview, you get access to all the same lessons, insider insights, and practice tools for a fraction of the cost. You’ll see the incredible return on investment as soon as your next interview. Make an important investment in your career and future when you start using Big Interview today. More importantly, your purchase is backed by our 30 Day Money Back Guarantee. We stand behind our training 100%. If you aren’t thrilled with the improvement in your interviewing, just email us and we’ll immediately refund the purchase. Pamela also offers private coaching. Would you rather spend $2000 on 4-sessions of private coaching with Pamela? Many people who can afford it do in fact work with Pamela - and you can email coaching@skillfullydone.com if you’re interested in the $2,000 training package. But here’s the thing, Pamela realized most people always don't have that kind of money, and they shouldn’t be deprived from her expert advice just because they’re short on funds now. So she created Big Interview to help people like you succeed. To help achievers succeed and get the best advice possible in an affordable way. She believes so strongly in helping people and how important interview practice is, that she is willing to risk her own money to help. That’s why she’s offering you a full, no-questions asked refund if the system doesn’t work for you. Would you be willing to spend $2,000 on interview coaching directly with Pamela? If the answer is “no”, would you at least be willing to invest $79 to learn everything Pamela teaches her clients, AND have the ability to practice your skills? In addition to developing Big Interview, Pamela Skillings spent 12 years working in executive level jobs in marketing and human resources for Fortune 500 companies (including Morgan Stanley, MasterCard International, and Citigroup) before launching her coaching and consulting practice in 2005. Our coaching company also works with corporate and government clients to develop training, retention, communications, and recruiting programs. Clients include Citigroup, American Express, Ernst & Young, the American Management Association, and the City of New York. I don’t think I have time to use Big Interview before my next interview. How long does it take? Don’t worry if last-minute anxiety is what brought you to this page, you’re in good company. We’ve even developed special features and training in Big Interview for when you’re down to the wire. Our “Fast Track” curriculum will give you all the essentials you need for an interview in less than two hours. Popping open the Interview Practice tool can give you some much-needed preparation in just half an hour (with plenty of insights and sample answers along the way). It’s not easy to even get to the point where you’re interviewing. Don’t let a good opportunity go to waste. Isn’t it worth investing a few hours in your future? I’m not sure I’m ready to start using Big Interview yet. Shouldn’t I wait until I have an interview on the calendar first? You’ll be able to make full use of Big Interview immediately, whether you have an interview on the calendar or not. Not only do we have training modules on resumes, cover letters, and landing interviews that could help, but you definitely won’t want to miss the lessons on initial phone interviews. If you want to seriously dig in for a competitive interview or just become a true interview wiz, the “Mastery Track” curriculum has over 6 hours of video content for you to learn from — plus the wealth of questions and mock interviews inside the Interview Practice tool means you can start preparing as early as you want, and never run out of new areas to explore! Why is access to Big Interview sold on a monthly basis? Because most of our customers are the proactive type, they usually use Big Interview for 2-3 months while taking on a new job hunt/career change. BUT we want candidates who need last-minute preparation to have affordable access to our training as well — so we’re able to offer one month of access as a cheaper alternative. There’s no minimum commitment, and canceling is as easy as pushing a button or sending a quick email. Start your one-month access pass to Big Interview today and start preparing for your future. Use the Lesson Curriculums, the Interview Practice Tool, the Answer Builder- and watch your upcoming interviews transform into exciting opportunities you can confidently seize, instead of anxiety attacks. Guaranteed. If you don’t see the improvement? Take advantage of our full 30 Day Money Back Guarantee. We’re so confident in our training that we’ve taken away all the risk. "Interviews make me really nervous, so I was seriously anxious about even practicing interview questions. But after using Big Interview, it wasn't as scary a process. Overall I was really well prepared- I was even asked the exact questions I'd practiced!" "I wanted to let you know that I received a call from our College President today unofficially offering me the new Senior Director of Operations position. I have worked with and for the President for 21 years which makes it difficult to make a new impression. But he told me that he was blown away at how well I interviewed and that I made him feel young and energized by my energy and passion for the job. In the end I had a total of 6 separate interviews for this position. All the practice gave me that extra boost of confidence I needed to go into the interviews knowing that I would be ready for whatever they asked. Thank you so much for your expertise and support." If you aren’t ready to make an investment in furthering your career, in opening up new opportunities, in building towards the life you truly want— that’s fine. We have plenty of incredible free material on our blog for you to read. Click the button and join Big Interview today. These are skills that you’ll use for the rest of your career. Yes! Give Me One Month’s Access to Big Interview for Just $79! And remember, the entire course is backed by a 100% iron-clad, money-back guarantee. Try the entire course at my risk. I'm confident you'll see extraordinary results. P.S. - DON’T walk into another interview without at least trying Big Interview and seeing how the training inside changes your approach. You can always make use of the 30 Day Money Back Guarantee. GET STARTED WITH BIG INTERVIEW TODAY!